You'll be £14.99 closer to your next £10.00 credit when you purchase Soviet Cold War Weaponry: Tanks and Armoured Vehicles. What's this? The T-54, T-62 and T-72 main battle tanks along with the personnel carriers, assault guns, self-propelled guns and anti-tank missiles that are illustrated in this photographic history represent the high point in the design and manufacture of armoured vehicles by the Soviet Union during the Cold War. Although the superpowers never came to blows, the 'Cold War' was far from cold, as numerous 'hot' proxy wars were fought in Africa and the Middle East, and these conflicts employed the Soviet weaponry that is shown in action in the colour and black-and-white photographs selected for this book. Between the 1950s and 1980s Soviet and Warsaw Pact countries produced thousands of tanks and armoured vehicles ready for the Third World War. They embarked on a technological arms race with the NATO allies in an attempt to counter each new piece of equipment as it appeared in service. Much of this Soviet weaponry has achieved almost iconic status and, despite its age, remains in service with armies, guerrilla forces and terrorist organizations around the world today. It is also of enduring interest to collectors, re-enactors and modellers who are fascinated by the military equipment of the late twentieth century. The information in here, coupled with the archive photos make for some more useful references for modellers. The T-54, T-62 and T-72 main battle tanks, along with the personnel carriers, assault guns, self-propelled guns and anti-tank missiles that are illustrated in this new photographic history... designed to provide a visual account of the defining conflicts of the late 20th and early 21st centuries. For Russian armor fans and modelers alike, Soviet Cold War Weaponry is an excellent pictorial guide and quick reference. In 159 pages, the author recites the main features, general history and geographical presence of the T-54, T-62 and T-72 MBTs along with personnel carriers, assault guns, self-propelled guns, anti-tank missiles and attack helicopters. The book is an easy read, very rich and quite enjoyable and is best described as a pictorial reference offering the general modeler and soviet military enthusiast quick access to the history and usage of the Soviet tanks and carriers along with the conflicts and battlefields in which they participated. 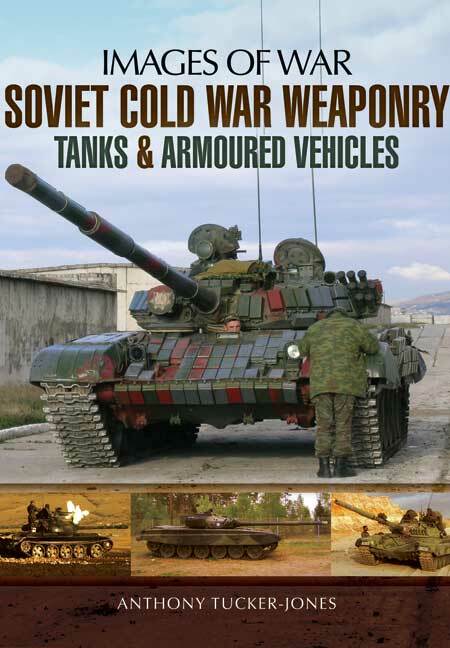 Highly recommended for Soviet armor enthusiasts. Anthony Tucker-Jones' effort is quite hefty and chock full of color and black and white photos of the subject matter, many of which were new to me. The book is broken up into twelve chapters, each dealing with a different area of Soviet armour design: T54/55, T62/64, T-72/80, PT-76, BTR series, BMP series, airborne combat vehicles, BRDM series, SPGs, ATGM, attack helos and a general assessment of Soviet equipment in combat. Overall, I found these chapters fairly logical in their structure and the grouping decisions. Each chapter provides a general overview of the vehicle family it is addressing, including a light smattering of technical details, internal vehicle layout and key features and flaws. There is a brief discussion of combat history and areas of deployment. Chapters are around 10-15 pages each and heavily padded with images, so the discussion never gets overly-complicated and largely remains at the entry level to the topic throughout.